Buccaneers are home to Shannon in the second round of the Ulster Bank League Division 1B next Saturday at Dubarry Park, kick off 2.30pm. After their disappointing display away to Ballinahinch, Buccs will be raring to atone for that setback when they welcome the nine times champions to Athlone. The Pirates made an unacceptable number of errors in the general basics of the game, but these are mistakes that should be readily corrected. Buccs will be keen to eradicate that performance from their collective system and all players are capable of playing much better than they did against Hinch. The squad will be bolstered should Saba Meunargia and Callum Boland be fit for Saturday’s match but, while coach Brett Wilkinson may tinker with his selection permutations, personnel, and/or positional changes are likely to be kept to a minimum. Shannon lost last weekend also, so a keenly contested tussle is anticipated as neither will wish to lose further ground, even at this early stage of the season. Coached by Marcus Horan, the Limerick side lost 25-19 at home to Ballymena last week when the damage was done in the opening half, during which the Ulster side accumulated all their scores. Outhalf Ronan McKenna scored all the Munster side’s points and Buccs will be well advised not to concede too many penalties to him. Shannon’s squad has not changed too much since last year when both they and Buccs won their home fixtures. Richie Mullane, Rob Deegan, and Shane Mullally are capable backs, with fullback Stephen Fitzgerald a player of rich potential. Conor Glynn and Tony Cusack are solid props, while Lee Nicholas, James Vaughan, and Brian Downey form a competitive back row trio. Much interest will focus on their new lock Riley Winter who has played for Australia U20s. If Buccaneers eliminate errors and play to their collective strengths, then a sustained and disciplined performance can get them back to winning ways. Buccs made a very disappointing start to this season’s Ulster Bank League Division 1B when they went down 35-13 to Ballynahinch at Ballymacarn Park on Saturday. On a beautiful sunny afternoon, it took this game some time to catch fire before Hinch, making fewer errors than the visitors, forged a bonus point victory. Their winning margin of 22 points was the same as when the sides met in the promotion/relegation play-off at the same venue at the tail end of last season. The Ulster side started with nine of the side from that meeting. Former Bucc, Stephen McCauley, came in at fullback for the northerners. Buccs, for whom Saba Meunargia was a late injury withdrawal, had seven changes in personnel as they gave AIL debuts at this level to Luke Carty (fly-half ), Dylan Quinn (prop ) and Jordan Conroy (wing ). Hinch punished an early Buccs error on 24 minutes. Rory O’Connor rose high to catch an up-and-under but dropped the ball. The hosts hoovered up posession to launch a telling counter-attack from left to right. Connor Joyce did most of the damage before sending McCauley scampering in for a try on the right against his former club. Quinn added the conversion and this score rejuvenated Ballynahinch, with David Nicholson making huge yardage on a couple of mazy sallies. Meanwhile, the Pirates were unlucky with some angled kicks that somehow did not find touch and Alan Gaughan was short with a long-range penalty with the final act of the opening period that ended with Ballynahinch 7-0 ahead. Buccaneers were swiftly on the offensive after Hinch’s restart went straight into touch. Following the resultant scrum in midfield, Buccs were more purposeful and patient in going through the phases and, when Evan Galvin was stopped short, Cian Romaine was in support to power over for a 42nd-minute unconverted try wide on the left. Buccs were now enjoying their best spell of the match and forced a penalty five minutes later when Joyce was guilty of slowing possession but Gaughan missed the resulting penalty. Buccs were to regret this error as Michael Graham rumbled through the centre before Hinch moved the ball to the right from where a perfectly flighted crossfield kick found Nicholson on the left flank. He then off-loaded to Joyce for a 50th-minute try which Jonny McPhillips converted. Conor McKeon took over the place-kicking duty for the visitors and slotted over a 53rd-minute penalty to leave the Pirates trailing 14-8 with the game still finely balanced as it entered the final quarter. 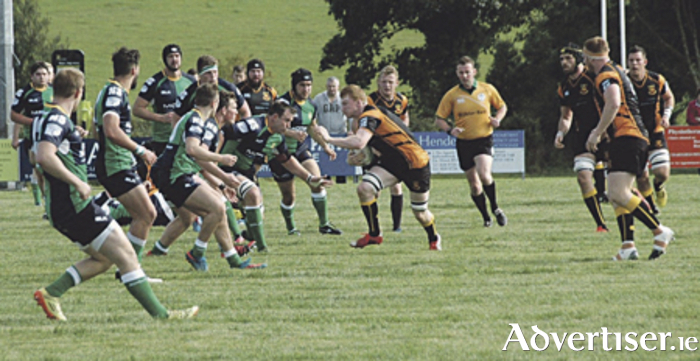 However, the outcome was settled with two home tries in a three minute spell that shattered the Athlone side as Hinch enjoyed their best period of the contest. Good pressure forced Conroy to make a fine tackle on Nicholson before Sam Windsor had the strength to get in for a 67th-minute try. From the restart, Hinch got a slice of luck when Joe Roe, although looking offside, gathered Conroy’s knock-back and Jordan Grattan capitalised to stride in for a bonus point try which took the steam out of Buccaneers’ challenge. Nevertheless, Buccs kept battling and they gained some reward for their efforts - debutant, John Sutton, was held up close to the home line, and Layden was on hand to surge over for a 75th-minute try. Ballynahinch had the final say when the impressive Windsor broke through in the final move of the game to notch his side’s fifth try. Replacement, McPhillips, enjoyed a 100 per cent success rate with four second-half conversions to complete the 35-13 scoreline. A more measured and aware all-round performance was sorely needed for Buccaneers, who, disappointingly, lacked precision and composure. Romaine was their outstanding performer and Quinn put in a very creditable effort while Layden was pick of a misfiring backline.